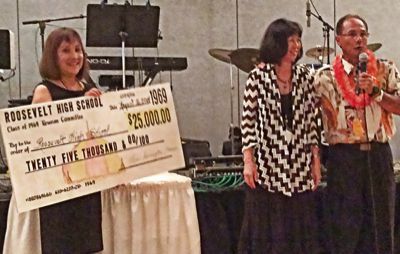 The highlight of the RHS'69 Reunion was presenting our 1969 Plus Zero Pledge to Roosevelt High Principal, Jeanette Uyeda. We are forever grateful for your most generous donation and consideration. We truly appreciate your trust in our decision to use your donation for what fits best with the students and school. We have already announced to our staff of your support for the Early College Courses' tuition for students and the mobile labs that are much needed in our buildings. Words cannot express the gratitude we embrace for the Class of '69. Please thank Vince and everyone in your Class from the bottom of our hearts. Roughriders forever! !